Ever since December 21st, we have been writing multiple, detailed letters, to everyone we knew “on the inside” at YouTube, with our Internet attorney in the To: field, and got nothing. 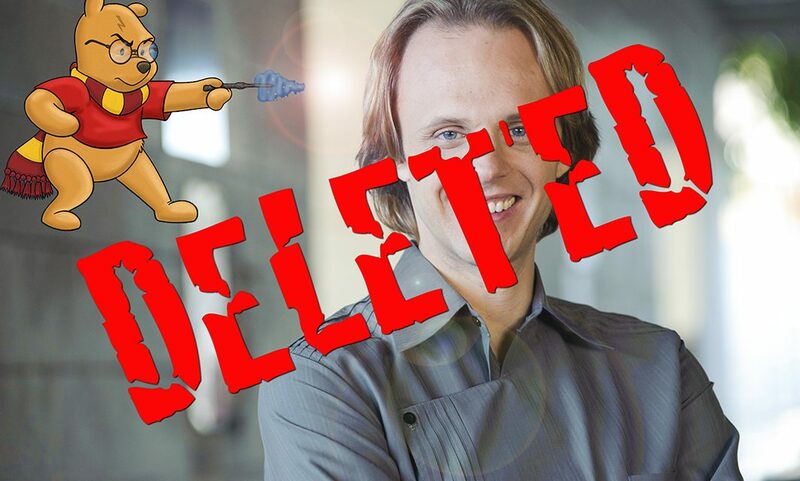 Now an anonymous individual has managed to destroy David’s entire YouTube presence. His stolen videos are still online and he is earning felony Grand Theft-level profits from them. This is punishable by up to three years in prison if he gets caught, particularly with his other crimes factored in — as we will discuss. Wild stuff. Get the intriguing facts of this case — and find out how you can help us regain David’s identity. Please don’t attack YouTube’s staff about this — we need their help. UPDATED 1/1, 1/2. This investigation got results. Less than 24 hours after posting this expose’, we were back up. See Section Two. Happy New Year 2017! 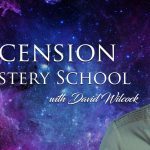 The last two videos announced my book The Ascension Mysteries — well before it came out in August 2013. That’s right. Over three and a half years ago. Ascension Mysteries and Endgame II were my YouTube comeback videos for 2016 after a long absence, as I finally picked up the author’s pen once more. Ascension had over 350,000 views and Endgame II was pushing 150,000. That’s half a million altogether — amazing numbers in today’s competitive market. My channel had been online since August 2010 without a single copyright strike — because I make my own videos with my own content. As explained in Endgame II, we have already been put on the “Fake News” kill list, so your help is needed now more than ever. Thanks! YOU MAKE SOMETHING, IT BECOMES YOUR COPYRIGHT… SO WHAT GIVES? Let’s just make this loud and clear: I am not a robot. My site is divinecosmos.com. 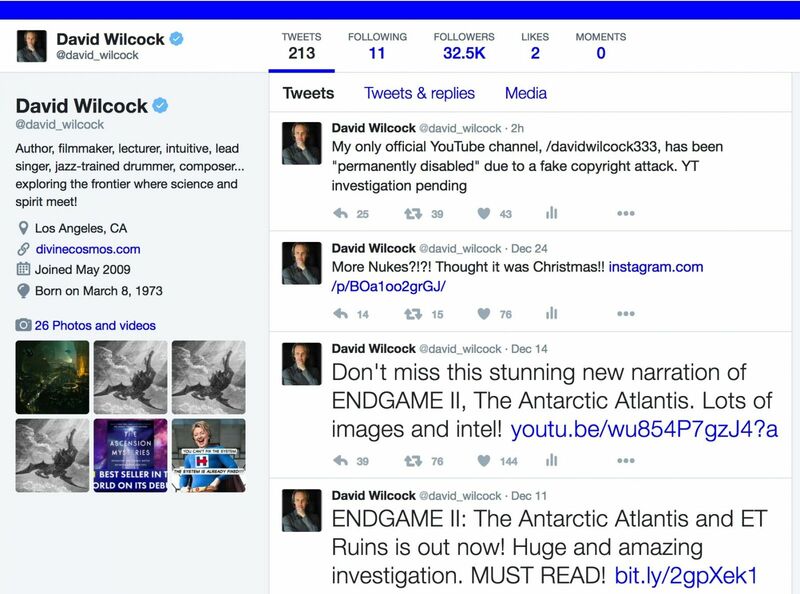 My only official YouTube channel is/was youtube.com/davidwilcock333. As soon as you type words, click the shutter on your camera (or, for many of you, hit the home button on your iPhone), apply paint to canvas or paper or lay down tracks for your next hit, you’ve got a copyright…. The thing is, is that, this should be obvious… since it’s, like, my face, my voice, my information and stuff, ya know. Duh! I also just bought a teleprompter so I can read the new articles I write and make videos out of them. That ain’t gonna happen until we get through this. Another robo-letter then said they “spoke to the team” and the case was closed. We lose. He wins. Period. The real guy did say the holidays were going to delay the team’s investigation, but this has already been going on for over a week. The next business day isn’t until January 2nd. 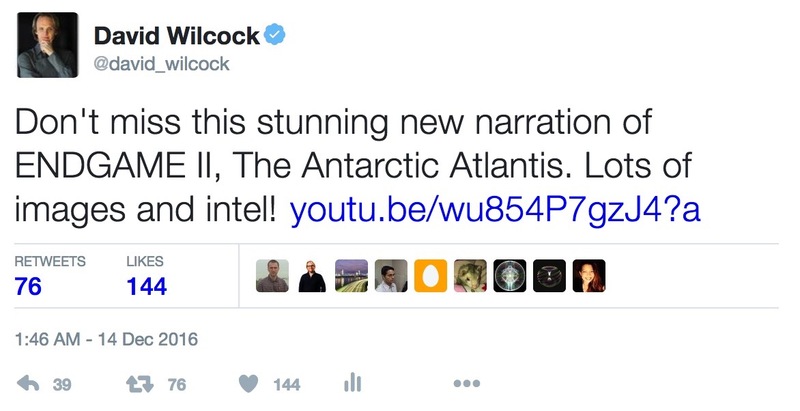 I narrated it. Corey Goode’s video guy added the images. There was no “Pizzagate” content in it, so it can’t be from the alleged ban on that topic either. How does a random, anonymous individual come to think he can own my voice, my writing, my narration and my content — jointly produced with Corey Goode and his team? 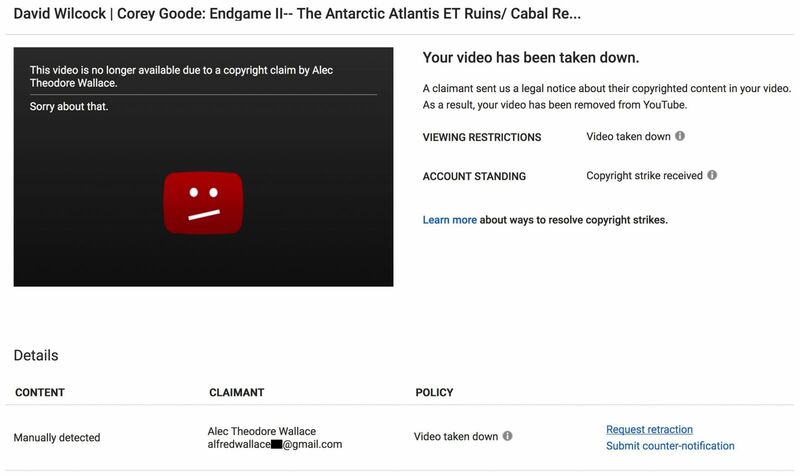 The other three links to my book-promoting videos also say the copyright claims were made by “Alec Theodore Wallace,” as you can see for yourself. Who’s name is on the cover of those books? How many books has Alec Theodore Wallace written? Has anyone ever even seen him? LET’S DO A SEARCH FOR ALEC THEODORE WALLACE…. I’m reaching a bit now, but come on. Something is going on. This just doesn’t smell right. Let’s try to find out who this guy is — and how he came to believe that he owns my voice, face and creative work. President Theodore Roosevelt was often referred to as “Teddy”, and had a popular children’s toy named after him. You want to know what song I feel should be playing in the background right now? Let’s take a moment of zen and really appreciate this. 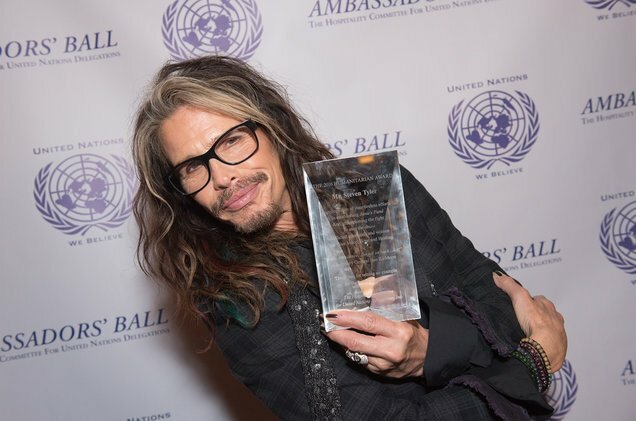 Steven is right up there too, and he just won a UN humanitarian award for “Janie’s Got a Fund,” creating advocacy support for victims of sexual violence. As I just leaked on Jimmy Church’s radio show the day before the attack, Steven and I have been friends for three years. He’s a very busy guy and we don’t talk that often, but he did show up as a surprise guest for my 40th birthday party. Steven is really ‘into’ the metaphysical stuff and his new solo album, We’re All Somebody from Somewhere, is truly superb in its musical and spiritual content. 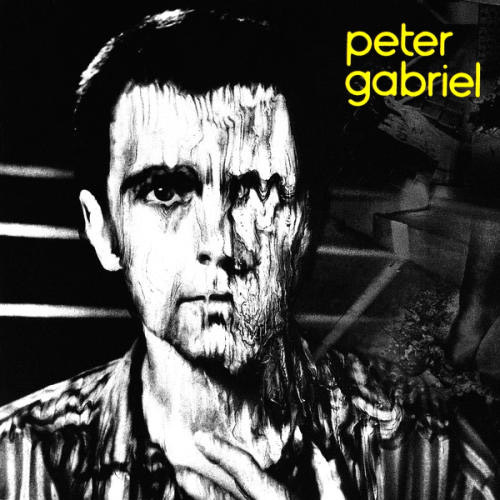 Never did I think that I would be able to empathize with Peter Gabriel’s “Family Snapshot” so deeply — a song written from the inner perspective of a Lee Harvey Oswald-type assassin. TAKE A LOOK AT THE INSIDER VIEW…. Now let’s drill into this outrageous violation a little deeper and look under the hood — mixing metaphors madly. Here is what I was seeing within YouTube’s own Content Manager before I got completely locked out of my own account. I blocked out part of his email address in this image, even though Mr. Wallace posted mine on the internet and encouraged people to send “hate mail” to it. 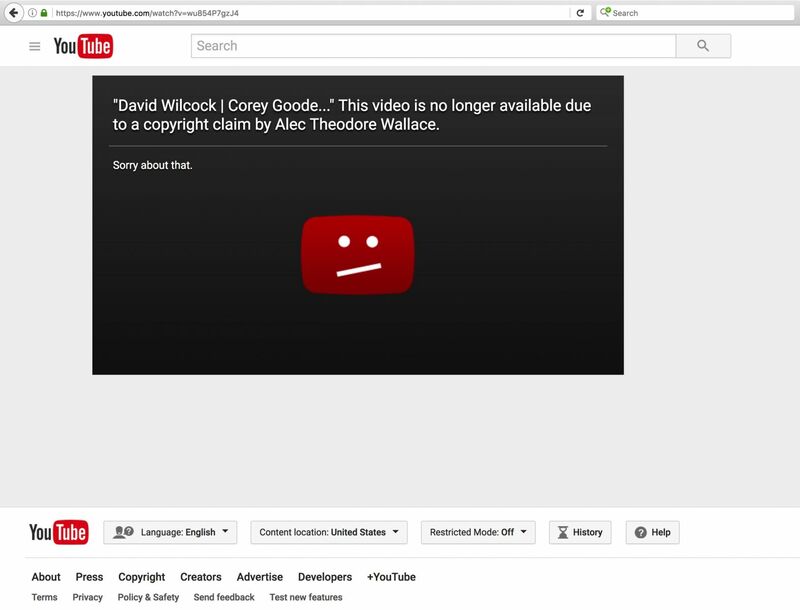 Wait a minute… how does “Alec Theodore Wallace” have anything to do with David Wilcock and Corey Goode? Just wait… it gets worse and worse. “Alec” is generally short for Alexander. Alec is an entirely different first name than Alfred. Now you’ve got Ted and Fred. But apparently they go together like peanut butter and jelly. Two integral components of a $–+ sandwich. WAIT…. 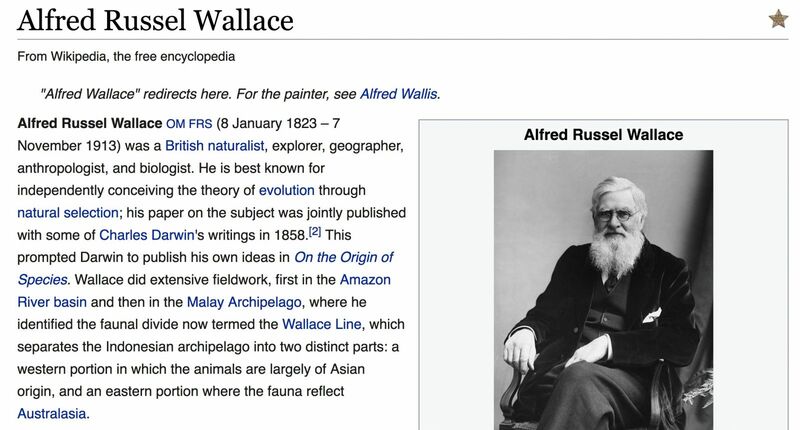 WHO IS ALFRED WALLACE? Hardly anyone else is competing for the name of “Alfred Wallace” on a Google search. Finally on the ninth page you find another one, but only with Wallace as the middle name — Alfred Wallace Downer, from the Legislative Assembly of Ontario. One small problem — “Wally” Downer died in 1994. 22 years ago now. 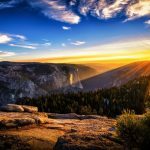 SURVIVAL OF THE FITTEST — A SPIRITUAL PHILOSOPHY? 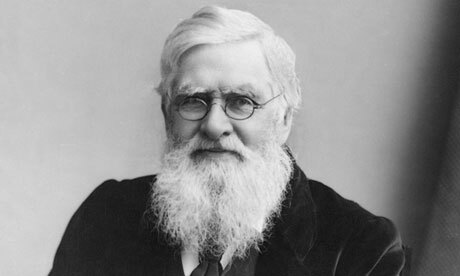 Alfred Wallace’s theory was that the best killers are the most highly evolved individuals on earth. They are the force that causes our species to transform. He is “hiding it out in the open,” if you will. We’ve already written extensively about certain folks who use tricks like this to get results. 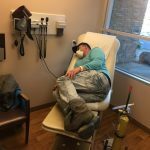 He may also think that most people will not take the time to research his assumed name — which is about three seconds of work — and discover its origins. I have no idea how “Mr. 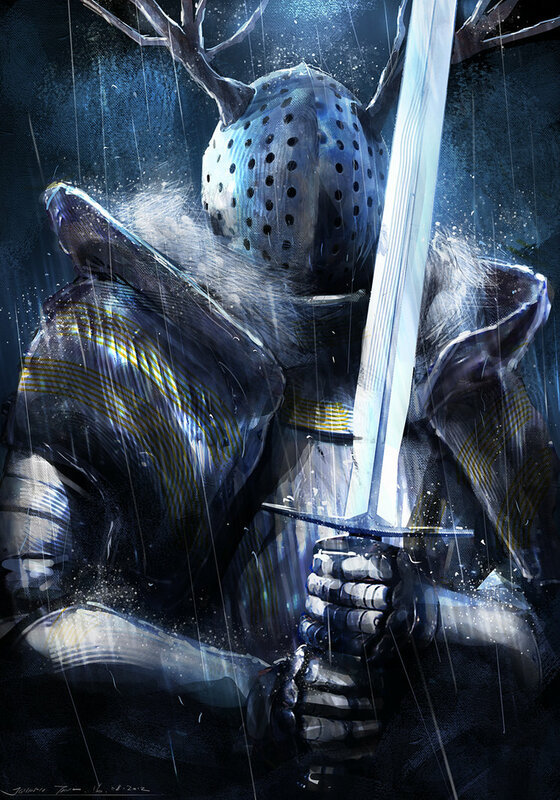 Wallace” was able to successfully accomplish this epic attack. And why didn’t the automated YouTube system simply check to see which video was posted first? How did I end up getting treated as guilty until proven innocent for over a week — until my entire identity was scrubbed off of YouTube completely? And he’s all out of bubble gum. This is one bear that definitely does not hibernate in the winter. Someone woke him up… and he is very grumpy. It all started when I filed a copyright strike against him after he stole my new video and rudely burned in his website address… throughout the entire thing. 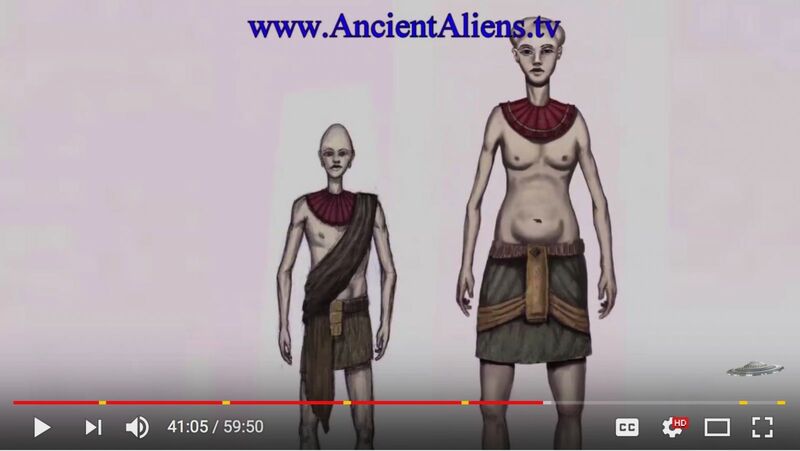 Hey, wait… isn’t that the copywritten image of the alleged “Pre-Adamite” giants from Corey Goode’s own visual FX team? Here are two images from my official, verified Twitter account of when this video, /wu854P7gzJ4, first went up — December 14th, 2016. Doesn’t that code, wu854…, look familiar? It should. It’s the digital name for the first video the Teddy Bear claimed the Right to Copy for. Shouldn’t YouTube have an automated system that decisively judges whose copy appeared first? Apparently not. 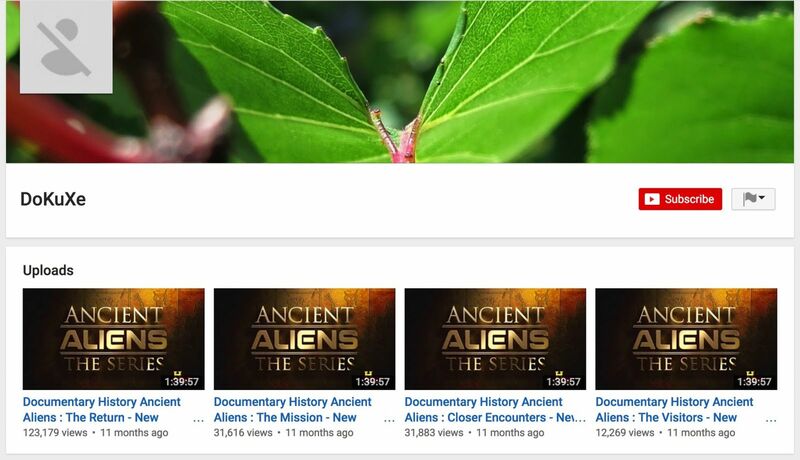 When we filed a takedown against this stolen copy on “Ancient Aliens TV,” it was already at 45,000 views. Corey’s copy had over 200,000 and I was at about 135,000. We had a soaring viral success on our hands. I didn’t put any ads in my version, as usual. If you don’t care about getting your own private room in the Big House, it looks like a high-speed Concorde jet stuffed with money. As this horrible saga went on, Ted filed three strikes, which is a kill shot. Apparently this works even if it’s done by one single individual only. How are you supposed to “serve legal process” to an individual with an obvious pseudonym — who gives you a slightly-incorrect hotel address and telephone number? 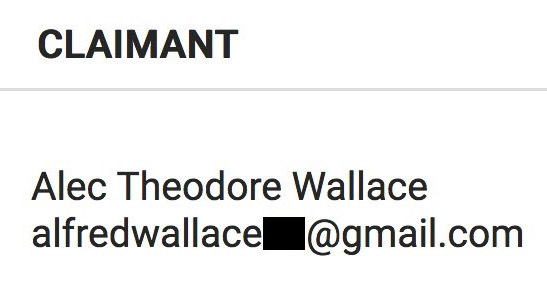 By comparison, when Mr. Wallace gained my information, he blasted it out on the internet and instructed his viewers to send “hate mail” to my YouTube email address. My channel would be dead in seven days… right during the longest holiday blackout period of the entire year. The longest I could wait was until December 30th — the day before New Year’s. No one would be working normal hours during that time. It was checkmate. 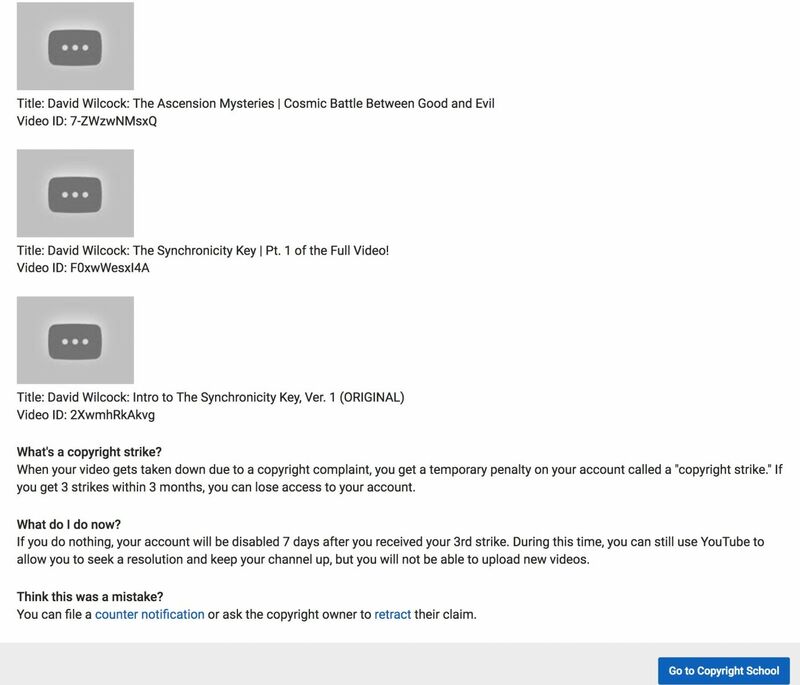 Ted then demanded that I reverse my single, existing strike against him, thereby re-uploading his stolen copy, in order to save my channel. I politely complied — under duress. I knew he was in complete violation of copyright, and had told him he was committing serious criminal offenses. My attorney was included in the To: field. He was amazingly persistent and felt he was in the right. I honestly had never seen or heard of anything like this. He acted like he was untouchable. Ted knew he had the gun. YouTube was doing nothing. As it went on, he became extremely rude and demeaning. YouTube AdSense revenues are generally estimated at being roughly 7 dollars per 1000 views if you put a “rollout ad” at the beginning of your video. Almost all of the stolen videos we will discuss do just that — and more. The article “You Can Make Six Figures as a YouTube Star and Still End Up Poor” profiled a YouTube star who was making $7.60 per 1000 clicks. An often-reproduced article on Quora.com estimates five to eight dollars of revenue per 1000 clicks. The dollar value increases when the audience has more “engagement” with the subject of the video, as in the case of a known public figure like myself. Therefore, at the $7 per 1000-view price point, a video with 100,000 views adds up to 700 dollars of stolen revenue. In the one week since my reversal, his stolen copy has skyrocketed to well over 220,000 hits. It’s probably one of the best YouTube scams he’s ever pulled off. Based on the average of $7 per 1000 clicks for video ads that roll at the beginning, he has now made over $1555 in estimated AdSense revenues. If so, it’s potentially a felony. It’s called Grand Theft in the state of California, where YouTube disputes for anyone outside the US must be litigated. 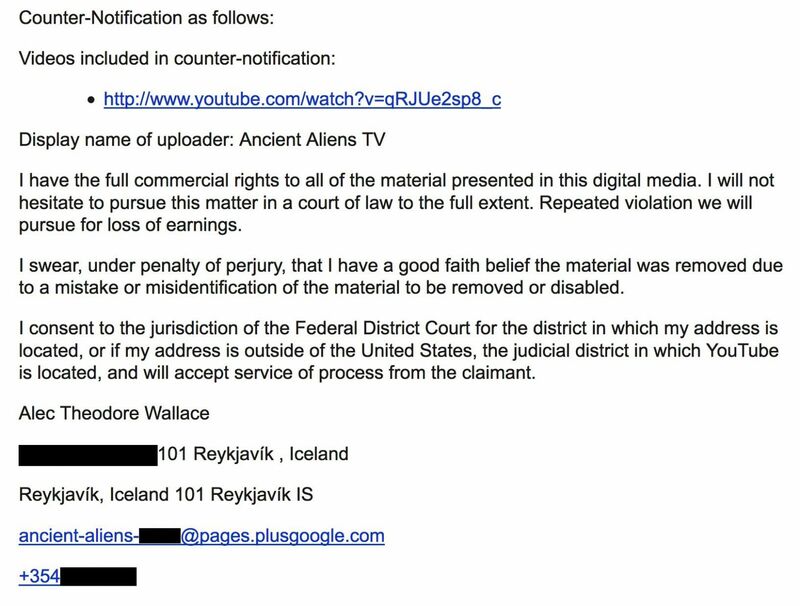 Ted claims to be living in Reykjavik, Iceland, so therefore this case will be subject to California law as per YouTube’s own notification. Let’s now take a look at what that law actually says, from trusted sources, just so we are clear on this. In the US, the 1976 Copyright Act introduced the doctrine of “Fair Use” in section 107. The Endgame II video was an audio narration of an article jointly written by Corey and me. That means we are the copyright holders. In the case of written works like an article, the guidelines are very straightforward and strict. I know them well after having three different published books with Dutton, a Penguin label. You cannot quote more than 500 words from a published work, as a single excerpt. …Although there is no precise definition of the concept of fair use, there are some informal quantitative rules of thumb that we can apply. Prose quotations of more than 500 words in one passage or 2,000 words throughout the manuscript, if from a single copyrighted source, probably ought to be cleared…. 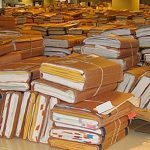 If the material quoted—poetry or prose—represents a significant portion of a work, permission must be secured regardless of the total number of words. Anything over 500 words requires written permission. Period. And if a “significant portion” of a work is copied, it is copyright infringement, which is a crime. As it says on the Purdue University Copyright Office website, copyright infringement is no laughing matter. In short, copyright laws do not permit you to duplicate the contents of an article we wrote and sell ads off of it. “Fair Use” for written works only extends to 500 words. WHAT DOES THIS YOUTUBE THEFT MEAN IN CRIMINAL TERMS? Any stolen monies that are less than $950 are considered “petty theft” under Ca. Penal Code § 514, which is a misdemeanor, subjecting a defendant to a possible jail sentence of six months or less, and a fine of up to $1,000. 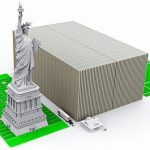 Once it crosses the line and goes over $950 — or a total of approximately 136,000+ YouTube views — it becomes Grand Theft, also known as Grand Larceny. Grand Theft can potentially become a felony under California Penal Code §§ 484 to 502.9. In other words, if your stolen video of our content does really well, and you actually make a thousand dollars, it could ruin your whole life. Ted promised we could resolve this “HAPPILY and amicably” if I did as he asked. He lied. Here is one of his emails expressing his Right to Copy philosophy. Firstly I have the full commercial rights to the content portrayed in the digital media outlined. You however do not own ALL the digital media in your production. You do not have the rights from me to use some or any of my content. And I have declared what it is. 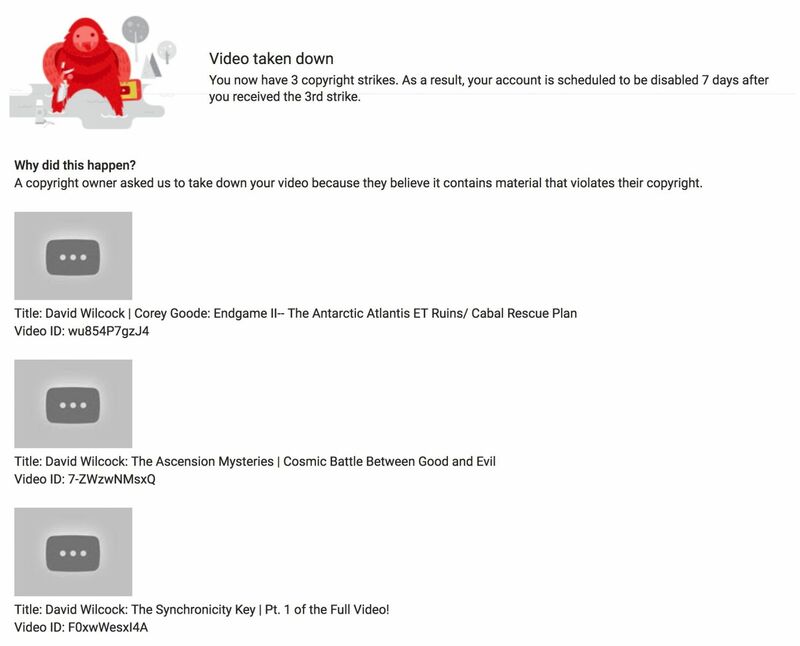 You should think before you serve copyright strikes especially when you are serving them on the copyright owner! You have struck my channel without the full copyright to do so. Remove YOUR copyright strike against me and I will do the same. HAPPILY and amicably. I like your content and am still willing to promote. With respect to any other websites advertised they are nothing to do with me. You will have to contact those parties direct. I can advertise whoever I like on my channel. Twitter or websites, Including you if you like, for free. But please be sensible. When it was time for him to re-upload his versions, he claimed he couldn’t get the system to work. I had absolutely no trouble reversing my claim. And why would the blue box say “these videos” if there were no videos below it? Every strike you ever make is on permanent record and shows up in the window at the link I sent him. He could very easily have copied the line “No videos were found” from another one of his YouTube channels, since he appears to have many of them. He then forwarded me emails where he claimed to be asking YouTube to reverse his copyright claims, saying it was a “dire” and “urgent” situation. I have no way of proving whether or not he actually sent those emails. My guess is that he never did. The silence was deafening. I tried to enjoy the Christmas season with my family and it was very hard not to talk about this the whole time. In this next email from the day before Christmas, he continued to shame and insult me for enforcing my own copyright, even though I had already backed off. This is a dire situation. It didn’t have to go this far, and I gave you every opportunity for it not to do so. I Will endeavour to fix all this as you have retracted your claim as promised. My word. Actions have consequences as you have now learned. I will do my utmost to resolve. The servers in Iceland update here 9am local time. Midnight West coast. It’s xmas eve here and I am make this my priority checking in the email thread. Until YouTube respond I am waiting. Don’t worry we will fix this. I have also lost 2 days earnings on a video at peak time. Which is minimal compared to you. I am in business too so let’s resolve. Iceland is a different system and believe it or not we want results as well as resolutions. Two days’ earnings? Minimal compared to me? Up until now I haven’t advertised on YouTube at all. And why insult the victim when you’ve already won? Again… in order to afford to do this full time, I have three jobs — Gaia, writing books and doing conferences. I rent one house. I have one car that is a 2002. Without juggling all three of these jobs, I couldn’t make it. All this work leads to an extremely busy life with hardly any time left over for friends or recreation. Additionally I have taken on the greatest negative forces on earth despite ongoing threats and the real possibility of danger to my personal safety. I have always had trouble with people trying to unfairly cash in on all of this as if it is a business, when for me it is a fight for the future of humanity. I am still getting nowhere with YouTube. 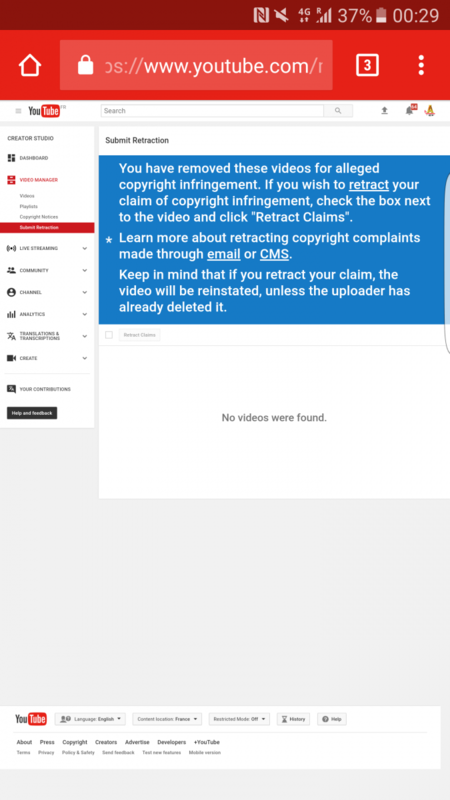 Please continue trying to revert your copyright strikes on your side as I did for you. Otherwise I will have to do Copyright School and there will be no new videos for three months. At the very least if you could send me confirmation of the written attempts you made for all three of the takedowns, that would help. His response to my very polite request was to file yet ANOTHER fake copyright strike! What happened to his word? What happened to any of the promises he had made up until then? Was anything that he told me actually true? YouTube still said nothing. I had three days left. Tick, tock. Tick, tock. Tick, tock. Tick, tock. I took Copyright School, as instructed, after firmly stating in writing to YouTube that this was not an admission of guilt. The guidelines appeared to indicate that this would preserve my channel for three months, during which time I would only be restricted from uploading to it. Their main purpose, other than to reinforce what you just heard, was to point out that copyrights protect images, audio and video, not people. I went to bed feeling relieved that I had finally taken action and this thing should now be over until someone actually figures out what happened within their support crew. And Boom! My channel was dead. Not for three months, as it appeared to say beforehand, but permanently. Copyright school only sped up the inevitable. 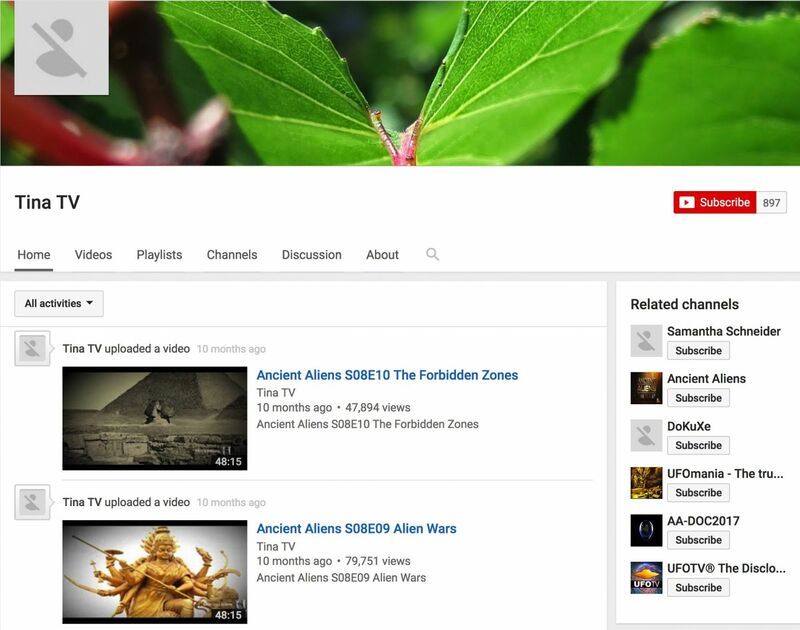 Check out the logos on his channel, Ancient Aliens TV. 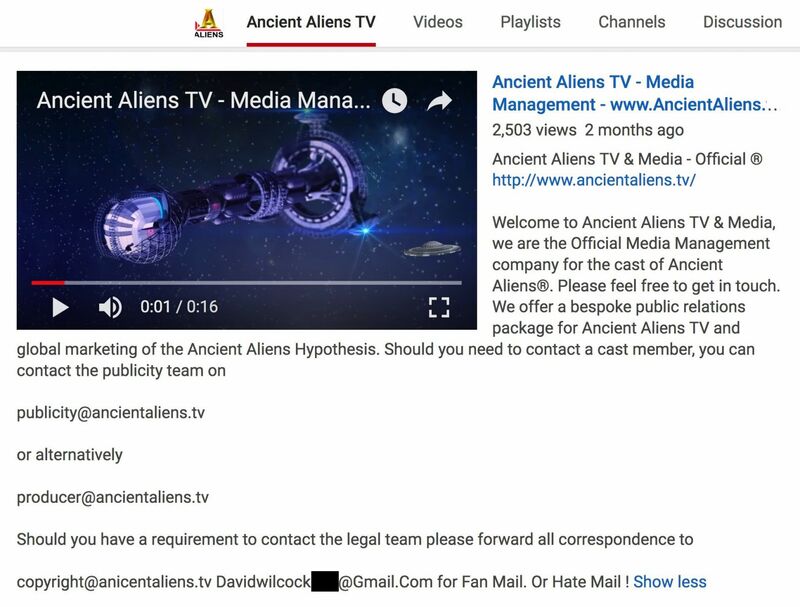 Check out the website name, ancientaliens.tv. I would strongly recommend not giving them your credit card information for any reason, as this may well be a ‘phishing’ scam. I knew that all along. Even better, he encouraged people to send “hate mail” to me at this address, as you can see. Corey set his own copy of Endgame II to Private, since it seemed this guy could temporarily get away with murder during the holiday season. Here’s the problem. His ‘earnings’ from stealing our content have already made him so much money — roughly $1555 and counting — that it is a felony. The “wobbler” clause in Grand Theft cases could easily tip over into felony category by the fact that he is also impersonating a major media corporation. Iceland may well be a safe haven, but even then this is an incredibly risky move. Anyone doing this would have to be extremely sophisticated and quite confident that they can evade any and all consequences for their actions. Why would this random individual be so angry at me? Why not just apologize for stealing the video and burning his logo into it, and walk away? I didn’t even bother to attack any of the other videos of mine he had stolen. Also notice the timing of when these uploads occurred. All but one of them were 6 days ago from the time the photo was taken — December 23rd, 2016. In other words, he uploaded four out of five stolen videos in a single day — Decebmer 17th — followed by another on December 18th. So, on the day he stole our Endgame II video, he didn’t just do one… he did four, and another one the next day. How could someone be this confident? And what exactly were we stumbling over here? 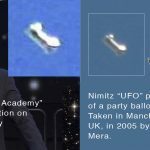 I have reason to believe that Ancient Aliens TV may be only one channel within a much greater fraud operation that we have been quietly investigating all year. Thousands of you have been writing in and complaining about all the fake videos — and this is the first time I am speaking to you about it. My identity has been stolen on an industrial scale — across dozens of YouTube channels — for all of 2016. Many others in my field are being hit by these same channels — in fact almost everyone. 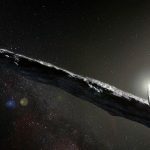 The “Ancient Aliens TV” channel openly features industrial-scale theft of videos from all the major stars on the show. They get taken down and more just keep coming up. It has been utterly incredible to watch… and very depressing. 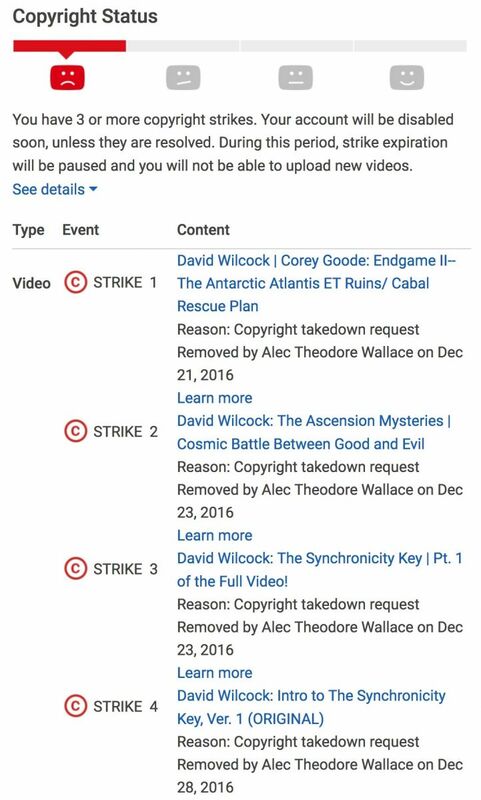 It all started in 2015, after I filed copyright strikes and takedowns on a fake David Wilcock channel — three different times. Suddenly they started blooming like mushrooms after a hard rain. That’s what 2016 has been like for me. Behind the scenes this has been deeply upsetting. I have drastically curtailed the number of radio shows I would do as a result, just to try to give this person or group less “New” content to steal. YouTube says you must pursue justice through individual takedown notices only. Their system is simply not equipped for anything on this level of scale. The size and complexity of what is going on is so vast that this would be impossible without at least three full-time employees — maybe even as many as 20. Is it possible that one individual could be coordinating all of this? Is it possible that I finally spoke to him after an entire year of stealing my identity on an epic scale? At least three times I have been “almost on the brink” of making a major public statement or video about this, but then stopped to focus on other things. All that footage is still in the can and can be brought out as needed. I have strong reason to believe that I have now come face-to-face in cyberspace with the guy who has been masterminding this operation all along. The Teddy Bear. 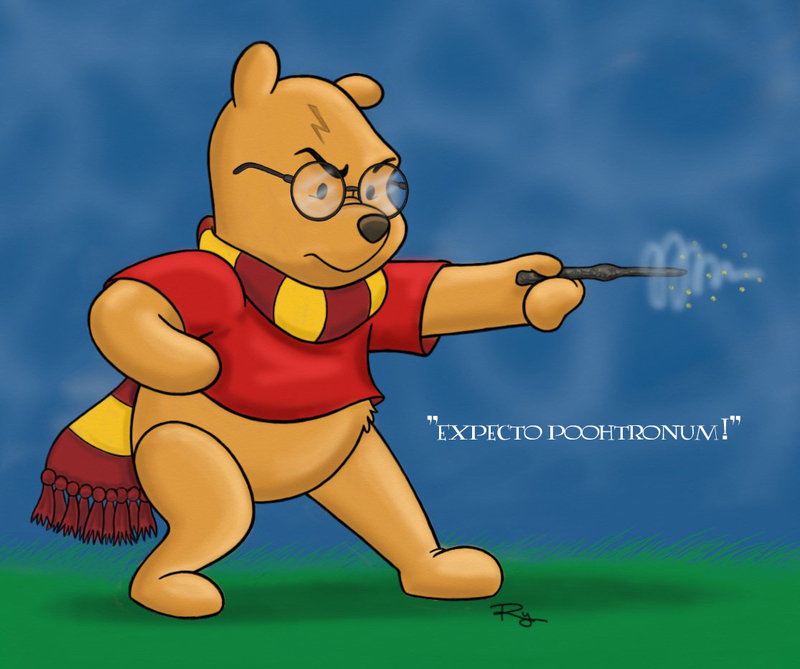 The Grand Pooh, if you will. Ted may be stealing content from everyone in the entire Seeking Truth field — in every sub-category — all across the board. Name a name on Ancient Aliens. 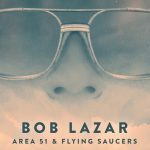 Name a UFO researcher. Name someone exposing financial tyranny. Get creative. YouTube never seems to be able to get to the root of this problem. If you think I’m being overly paranoid, just wait until you survey the evidence. It is hard to believe, and it would take multiple employees to pull this off. Worst of all, even after humiliating me in written emails about how much money he thinks I make, if this is him, then he has almost certainly profited far more from my labors than I have. Why should one guy’s crime ring be draining everyone else’s vitally-needed ad revenues, if that is in fact what is going on? It’s not fair and someone needs to speak up about it. All of this data has already been turned over to YouTube in emails that up until now seem to have been almost completely ignored. Yet, almost all of the impersonating channels I pointed out in the below email from August have since been taken down for fraud. I have no idea how this was accomplished but it didn’t come from me. There are obviously going to be others re-uploading videos as well, but sure seemed obvious all along that we were looking at a centralized operation. Notice the strength of the wording: Multiple or severe violations of YouTube’s policy against spam, deceptive practices and misleading content. That’s a much less severe-sounding note. You are about to read a partial excerpt, with links, of a major email to YouTube that ultimately got me nowhere. 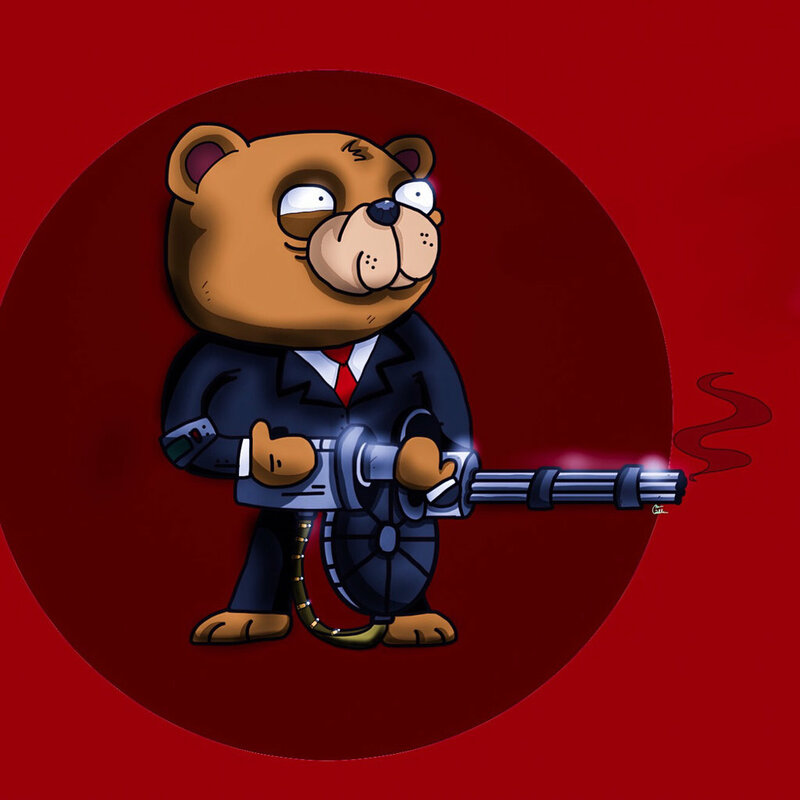 I honestly do not think any of us are going to stop the Teddy Bear, if he really is doing all of this. The trick is simply to adapt to him and figure out how to increase security. Later in August, I filmed myself going through all of the following channels while they were still alive and well. It is absolutely astonishing to watch. 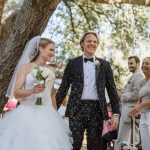 The number of stolen David Wilcock videos that could be uploaded, per day, could be as many as 12 to 20 on one single channel. Most of them had very few hits, but about one in 25 did well. About one in 75 did very well. In addition to many of the deleted channels I filmed, the same formula is still being used on many other active channels, along with the same art, as you are about to see. These images were occasionally paired with images of Asian girls to make it appear that this was being done out of Southeast Asia. I expect Ted will be very busy in the virtual “shredding room” tonight, if he is the guy actually doing all of this. We have already documented everything. 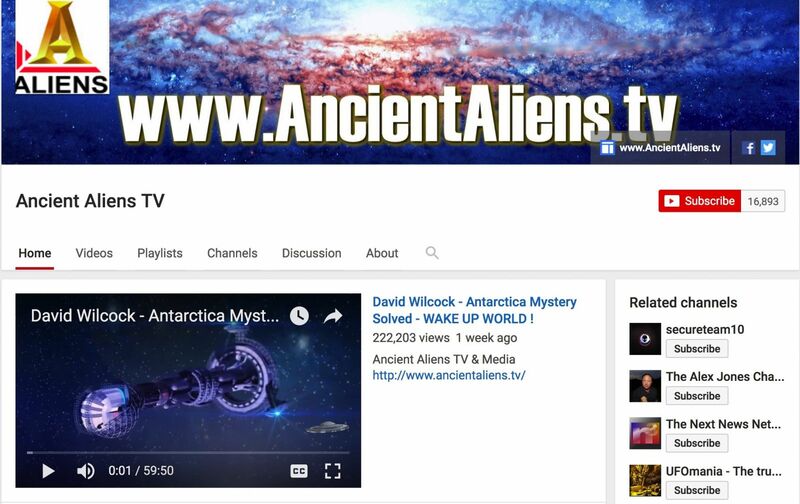 Right for now, you can click on these links to channels stealing either Ancient Aliens episodes, DW or both, and see the connections. 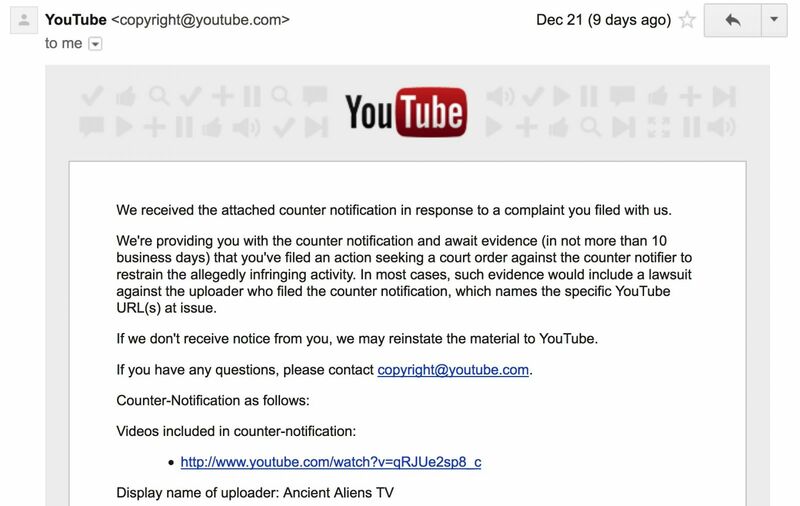 This data was sent in to YouTube on December 26th, under Subject: Re: [0-4185000015108] [1-1317000015183] YouTube Partner Support PROOF OF HUGE THEFT OF ANCIENT ALIENS EPISODES BY SAME MAN. It goes without saying that watching bootleg copies of these episodes on YouTube is stealing from me, the other talents and the production company. Please use legitimate avenues to watch them instead. Here is the original letter that was written back in August, before I had retained an attorney to help me fight this incredible problem. 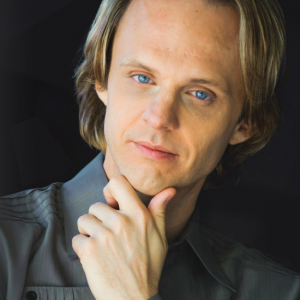 Countless thousands of people have been complaining about the massive number of “fake” David Wilcock videos that are of old radio shows, but marked as new. [UPDATE NEXT MORNING: Jimmy Church revealed last night that the same thing was happening to him. He has 578 radio shows out there. He was doing at least 50 takedowns a day in groups of 10 until he got a partner affiliate company to handle it for him. Thousands of people were writing vicious hate comments about false advertising and over-indulgence in ads, as if he had done all of this himself. You can just scroll through this email until the red text returns if you don’t want to go through all the specific details. Subject: Re: [7-7777000012905] URGENT: Truly awe-inspiring scope of identity theft discovered. What do we do about it? In short: I have identified at least 15 different channels that are all stealing my content on an industrial scale that is nothing short of staggering. They must have realized they can harness the draw that I have and create enough AdSense money to keep doing it. Every radio show or public performance I have ever done, many of which are quite old, is being re-packaged as “2016” and “New” and re-uploaded constantly. This is fraud. My audience is being massively misled. Legitimate videos are being absolutely buried in mountains of “new” garbage on a daily basis. There is an awesome malevolence behind this. Your privacy complaint form requests that I contact the individual myself. In no way do I want to engage with whomever is doing this, as it seems unlikely to be only one person. I can only conclude that there must be some sort of software bot that they are using to do this, as the scope is utterly enormous. You literally have to see it to believe it. That requires a brief but revealing investment of your time in clicking on the “All Videos” lists below. Many of these channels have similar-sounding generic titles and are using the same or similar graphics on their title screens, as you can see. They show no evidence of a personality who is filming him or herself and are strictly re-uploading material that is not of their copyright. There are about six other channels I could send you that have fewer of my videos and more of others in my field. 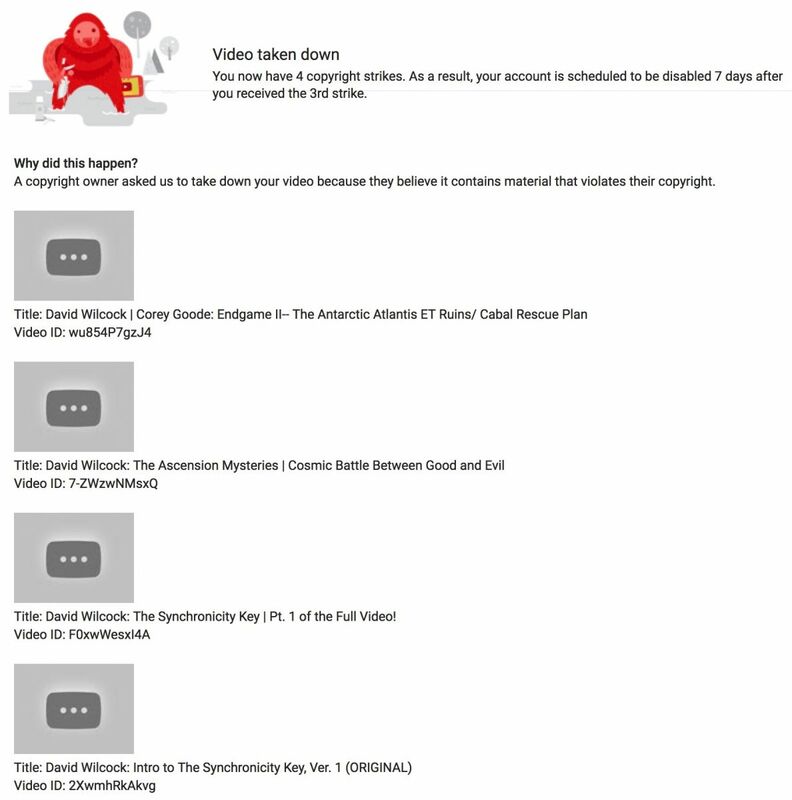 However, any one of them has at least five of the same stolen videos re-uploaded. Given the choice of channel names, graphics, the people who are being stolen from and the complete lack of film of private individuals or the establishment of identities, I believe these are all the work of the same individual or group. This person may be making enough to survive by doing this, but it is absolutely strangling all legitimate content from YouTube of several individuals in my field. Any help you can provide us with would be greatly appreciated. Here are the other examples I found of the same person or group doing their work, where I am not so blatantly being ripped off. I know this is a lot to look at, and it affects others in my field besides just myself. I do not believe this will go away even if all of these are taken down, but I do believe this is a good start. A serious investigation is required into what is going on here. I believe people are buying short-term mobile phones, validating these accounts and hiding their identity. Any help you can provide would be greatly appreciated. This may also include a workflow for me to continue reporting these channels as they pop up. Our immediate recommendation is for you to please NOT threaten or harass YouTube personnel about this. We do not expect to get any personalized customer service for this investigation until after New Year’s Day. In the meantime we are dead in the water. 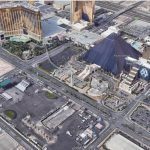 While writing this article, we were contacted by a good friend who appears to have a more direct access point to YouTube. Hopefully that will speed this up. In the meantime, let’s now cover the cosmic aspects of this strange and depressing story in Section Two. The corrupt Feds are trying to censor his federal case files by mass sealing order. QAnon needs to add his case as a candidate for the wrongful sealing of his case files. His case needs to be monitored in case he ends up murdered or suicided. 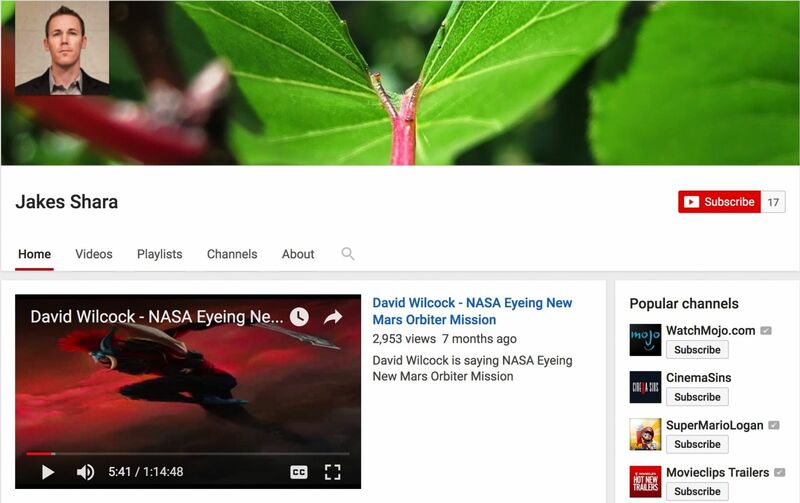 youtube channel for The planet around the Earth has Wilcock’s stuff up, too. ok corey.. this type of scammer is taking advantage of the Piritar party (pirate party) tennets of being allowed to make copies of things for personal use. If you fly to iceland (lovely country of sensible artistic people with a low population) and get an icelandic lawyer, they can easily track this troll down and end his international scam. Believe me the icelandic government does not want their tourism industry blemished nor does the piritar party want the worst interpretation of what they stand for to become international news. oh look, california has a branch of the Pirate Party too. this seems like a good PR opportunity for them. You just need to make this issue matter to people who live in his vicinity and suddenly the needle will move. Either that or cast a reality tv show in iceland with a bunch of harddened punk rockers, and televize the manhunt for this weasel. Dutchsinse on youtube predicting possible earthquake in Oroville region in coming 2-3 days. Does not belive quake would destroy dam…but he might not factor in possible cabal planted explosives to be set of at same time…some think this caused original damage to main spillway. 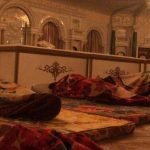 Help focus on reducing impact of such event, no matter what the cabal may or may not have planted there. I wonder if the lay line extends up to “Vault 7”? Alright I have come up woth an idea of an economic system that aligns with the blue avians message. 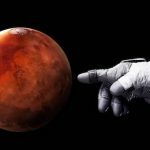 It’s called Karmaonics.check it out I need help with it! Do you also wonder about the island of Mu…also called Lemuria? I was at the ancient alien forum at the LA conscious Life Expo. I had to giggle when the Panay mentioned PawnStars and Oak Island as being History Channels most watched. I say this because those shows was a catalyst to my finding about Gaia and the Law of One. Here’s how. My boyfried always watches those shows among others. At first I would watch it too. When it got to the point he was watching previous episodes over again, I had enough. So I got my IPod out and just started searching for various things. I came across an episode of David and Corey. My first thought was “what the …” but I kept watching. Searching one thing after another, I ended up subscribing to Gaia. I purchased the Law of One series and other books. I purchased Audio books to listen to while driving to work. My entire way of thinking has changed direction. I am very new to all of this. [Quoting "Paulie"]Hi David – I wish I had the inside knowledge that you do. I want to stay positive and think that the Cabal has been defeated as you stated on Coast recently. Definitely awesome that California’s drought is over. However – any chance that the plan stalled once again? Fulford said for like the 20th time in the last few years that Cabalists were going to be arrested this week. We now have the new AG Sessions and no arrests so far. But most alarming, the drums of war with Iran are getting very loud. Could we have been totally Trumped again into another huge war? I hope you comment on the war with Iran in your next article. Thank you David. David also said the chemtrails were done, and that is CLEARLY not the case. Saying that the Cabal has been defeated was just a teensy bit premature, I think. Asks why they would build Fukushima at that location… then give the answer at approx 15min….intentionally or not? 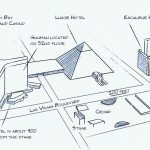 I saw this posted on the KP blog. It’s a video of Byron Katie leading a group of people through some work who are afraid of what Trump will do to the planet and to humanity. I think this is the type of work that Trump illicits in all of us because of his persona. James posted that Trump was a catalyst to transformation and not a savior. I think this is true. Trump’s personality and abrasivene nature is forcing our fears to the surface and many of us still have to learn how to deal with these fears. I think this is a key component of our ascension. It’s frightening at first, but if we do the work as the video suggests, it becomes a very liberating exercise and it opens the door to wisdom, peace of mind, and ultimately frees us to create a new paradigm for us to live in. Have you seen or heard Assange lately?? The American people are waking up in droves, we are taking to the streets in record numbers, Vets are protecting Native Americans (how times truly have changed)Lawyers are fighting for the people, scientists are speaking out. The time for change is truly upon us and we could not have done it without the vileness of Mr. Trump to use as our catalyst. Many of the protesters don’t care for the U.S.A. They’re paid by Soros and do alot of brownshirt activity. And while you’d like to credit Trump for this awakening, I’d go all the way back to Bush 41 and the continual line up through Obama. Ive been following David for years, Ive read all of his books and I visit his website daily to read all of your wonderful comments. I feel drawn to post because of all the hate on Donald not being the savior we were promised. Donald Trump is not your savior and no one ever said that he was. He is the catalyst we need to change our selves, to save our selves. Great point! Trump’s presidency has allowed me to leave politics behind. Side Note: Always trying to find something new to study, anybody familiar with Aleta Baker and the Order of the Portal? What is Vault7 in Wikileaks? 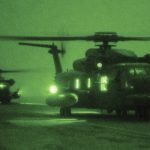 This is a great article on how relations are changing between the US, China, and Russia and how this will likely lead to global peace and disclosure. 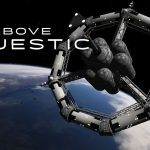 Has anyone here built or used a working free energy/over unity device? 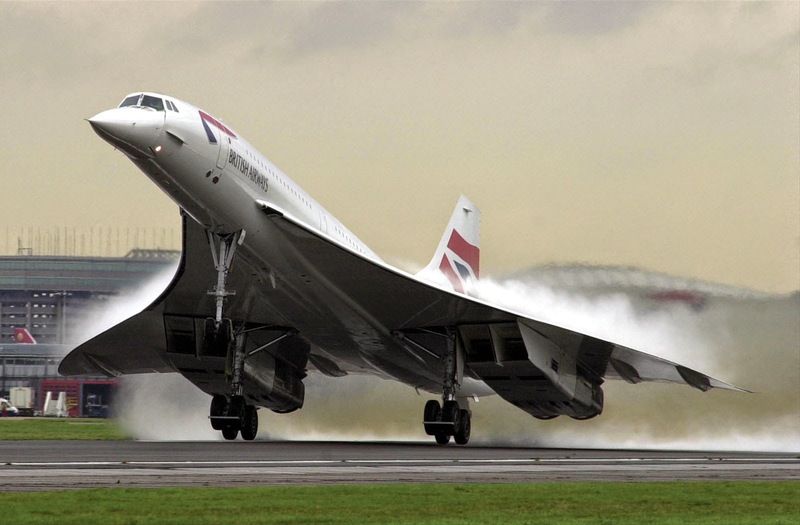 I want one to power my house & if it could be powerful & light enough would use it on small man carrying aircraft. I’ve seen a few different designs but the specs are too vague & instructions lacking. The sun has turned from yellow to white, are we sure it’s not just something in the atmosphere? I have been feeling really mentally energized lately though & compelled to discuss a lot of Davids & Coreys revelations to my friends & customers. Total strangers will listen & 99% seem & say they are very intrigued & it’s ringing true for them! Anybody else feeling this way? I sense we are winning in a big way right now…I was getting pretty tired of the battle after my 15 years in it. Thanks! [Quoting "Paulie"]Hi David – I wish I had the inside knowledge that you do. I want to stay positive.Thank you David. As I watch trump’s actions with regard to diplomacy I can’t help but wonder if all of it is a big negotiation ploy. Trump is a great negotiator. It’s possible that he is trying to position himself in a more powerful negotiating position by some of his actions. Look at China, two weeks ago everyone was saying war with China was a real possibility and trump had ships in the South China Sea and then he refused to acknowledge the “one China” stuff. Then this week he has a conversation with China and he now supports one China and it no longer looks like war with China. I suspect a lot of the posturing by Trump is intentional to give him more leverage. I’ve said before. I’m neutral on the guy. I am just taking it all in right now without passing judgement either way. Hope WikiLeaks are setting up the Full FD Data Dump.. Please Assange… release it all!!!! NOW!!! Flood the net with the truth! Hi David – I wish I had the inside knowledge that you do. I want to stay positive and think that the Cabal has been defeated as you stated on Coast recently. Definitely awesome that California’s drought is over. However – any chance that the plan stalled once again? Fulford said for like the 20th time in the last few years that Cabalists were going to be arrested this week. We now have the new AG Sessions and no arrests so far. But most alarming, the drums of war with Iran are getting very loud. Could we have been totally Trumped again into another huge war? I hope you comment on the war with Iran in your next article. Thank you David. Interesting goings on in California. As David mentioned in his comments on the Fulford article with regards to the rain and how much it has been, Jim Stone reports on the damage done to the tallest dam in North America, and he believes it has been intentionally sabotaged. I just read in Fulford comment section that George H W Bush might be a reptillian and/or German spy…. Made me think, could this be where Ronnie got inspired/scared, resulting in his Alien Threat address to U.N….. I have no opinion on Trump, He says a lot of things I despise. If i could choose, He would not be “The leader of the Free World”. I note however, MSM seems to me to be REALLY pounding on him no matter what….WHY? And for all those so hatefull of Trump as POTUS, Would Hillary really have been better? And so.. here we are…still headed for the cliffs, but maybe so is the cabal.. I really wish the comments approved by the moderator would follow the “rules”. You know the ones highlighted above the posting fields. I find it hard to see the relevancy of arguing what the current president has or has not done, to the article. I think the forums would be a better place for such banter. I used to really enjoy reading the comments and finding interesting thoughts and links to relevant articles and info. Now it seems to be an overwhelming amount of people arguing their varying opinions of irrelevant subject matter. [Moderator: I can’t argue with you. We would have asked that this discussion take place in the forums except for the fact that the forums are temporarily down. 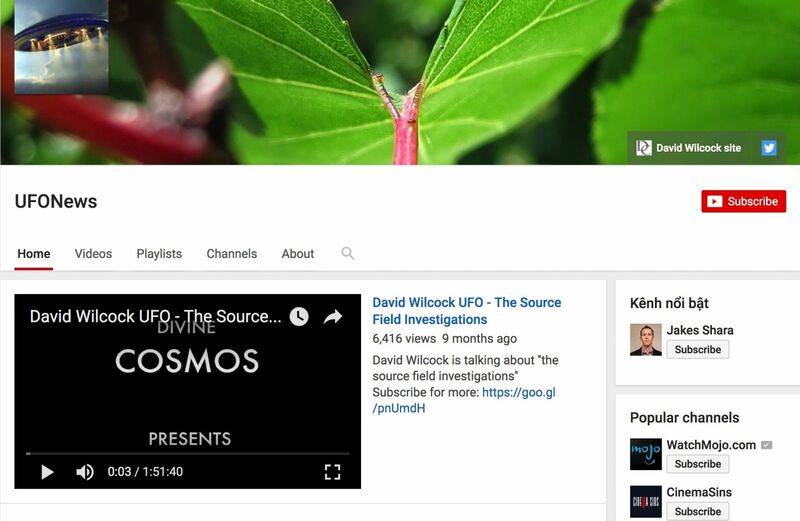 We are however now asking that discussions take place in the comments section of David’s shows at Gaia. My thumbs-up vote is not for your comment but for the Moderator’s excellent reply. 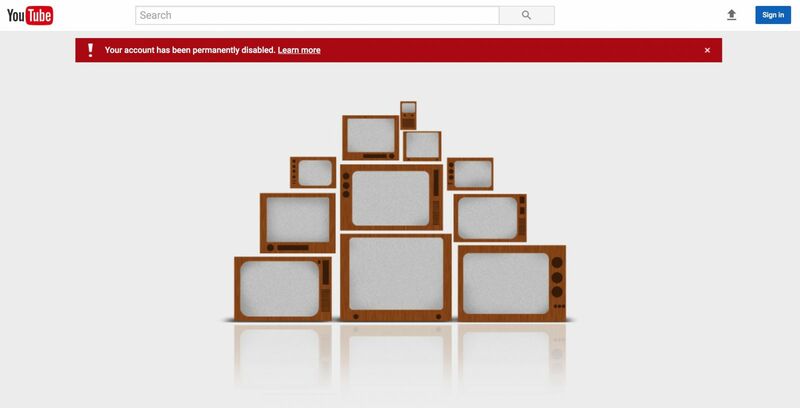 Wow, youtube definitely unsubscribed me to DW’s channel. Is it not synchronous that a team named the Patriots with identifiable Trump supporters in the coach and quarterback are playing in the Super Bowl? Here is some news to feel good about. Looks like the good guys are making some headway in LA. lets do what we can to keep this kind of momentum going. Say a prayer, meditate or maybe pass on this story to your local police department and let them know that you support them and hope they’re conducting similar investigations to protect our children. We need to do everything we can to deny lucius his loosh! Interesting stuff here showing gigantic earth size orbs sjphoning plasma from the sun. The whole video is quite interesting but the orbs are from about 6.00 min on.